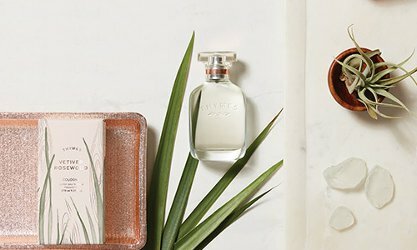 Thymes has launched three new fragrances: Vetiver Rosewood, Lavender Honey and Eucalyptus White Tea. Vetiver Rosewood ~ Oriental. "Vibrant lemon and grey sage create sparkle while heady ylang ylang and rosewood create a glowing wash of warmth. Vetiver root wraps the blend with its refined woody and green aroma to create a masterful composition." Lavender Honey (not shown) ~ Fresh. "True essence of lavender sweetened by modern gourmand notes of amber honey and delicate creamy heliotrope. Golden tonka bean and atlas cedarwood leave a trail of warmth." Eucalyptus White Tea (not shown) ~ Fresh. "An exuberant infusion of purifying spearmint and eucalyptus steeped into herbaceous white tea. Cozy cedar leaf and fir needle bring a clean and lingering finish." Thymes Vetiver Rosewood, Lavender Honey and Eucalyptus White Tea are $40 each for 50 ml Cologne, and are also sold in matching body and home products. Rosewood! Definitely a must try for me.